A quick but elegant way to label gifts, file folders or envelopes, our new Label & Seal Sets include stickers of assorted shapes and sizes for every task. This Hither Creek design coordinates with matching gift enclosure card, gift wrap, thank you notes, list pad, journal and file folders. 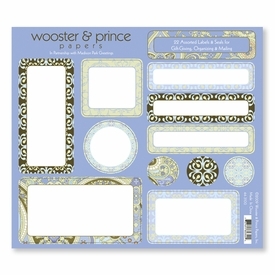 Pack contains 2 sheets, each containing 2 mailing labels, 3 gift labels, 3 file folder labels, and 3 envelope seals. NOTE: Only 2 left!